Built: First mentioned in 1053. 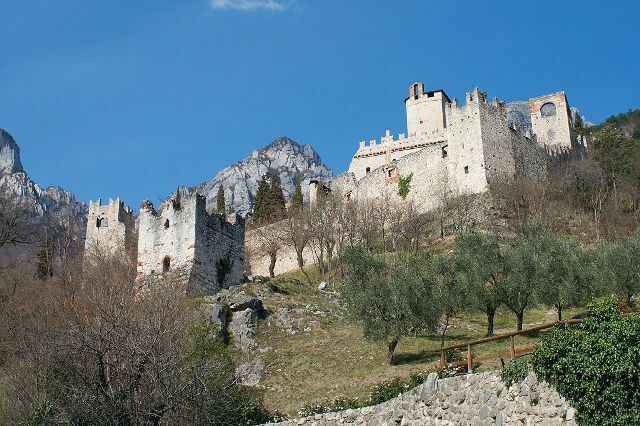 Notes: The Castle of Avio (also known as the Castle of Sabbionara, Italian: Castello di Avio, old German: Schloß Aue) is a medieval castle in the comune Avio, Trentino, northern Italy. It is currently hold by the Fondo per l'Ambiente Italiano (FAI). It is one of the several castles commanding the Vallagarina valley of the Adige River. It features several rooms with medieval frescoes. The castle's rooms are decorated by a series of frescoes, undertaken in two different campaigns. The first is the "Chamber of Love" (Camera di Amore), dating to c.1330 and painted by an unknown workshop that had already worked in the Chiesa dei Domenicani in Bolzano. This room features scenes of love visible through the openings of a large painted brocade or curtain. Cupid, mounted on horseback, chases after a lover and shoots him with arrows. He is then shown making love to a young woman. The second cycle was executed two or three decades later, c.1350, and features less elaborate paintings of battles.